The ancient technique of Acupressure is described as holding points along the organ meridians (energy pathways n the body) with threrapeutic finger touch by an Acupressure practitioner to open up the blood energy circulation inside the body. JIN SHIN DO means the-way-of-the-compassionate-spirit. The Acupressurist is facilitating an unconditional loving and non-judgemental space for the client to move from fear into self-loving, calm, and an all-is-well state of mind. In traditional Acupressure application the client stays clothed and lies on her/his back on a massage table. Comfortable clothing is recommended. The Acupressure Therapist uses her fingertips holding gently but firmly two Acu-points at a time until she feels the rhythm of the freed up flow in the meridian and then moves to the next points. The client experiences a sense of deep relaxation, release of muscular tensions, and peace during the session. QIGONG is a 5000-year-old health tradition in China with a comprehensive system of theory and practices that integrates ancient wisdom, modern science, and the mind's creative power to transform our lives from dis-ease to health and well-being. Qi-gong means cultivation of energy. Qi is energy. Gong is cultivation. Qigong is a precious gift from the Chinese and Qigong is the mother of all Martial Arts. A Qigong practice consists of gentle flowing movements while the student and practitioner is standing or sitting. Conscious breathing, specific sounds, and visualizations are often added to the specific movements. In Qigong we learn to connect with and absorb the unconditional loving, healing, and intelligent energy present in nature and in the universe - this integration harmonizes our body and mind. Qigong is known for restoring healthy blood-flow, for chi and blood purification, for activating self-healing processes in the body and for helping us to become more peaceful and focused. 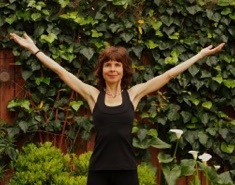 A regular Qigong practice boosts our immunity against disease and mitigates stress symptoms. 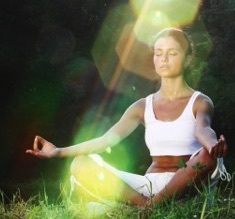 In MEDITATION we identify with our True Self, with our inner being of love, joy, peace, and wholeness. Its the most effective daily remedy for “getting well again” as we go through experiences of minor or more serious discomforts and ailments. It helps us to see our challenges from a more heart-centered perspective and respond to them from a place of compassion and true understanding which eliminates further suffering for ourselves and everybody involved. Meditation is a great way of starting your day. It starts a wave of peace that carries you throughout the whole day. It makes you flow easier with your daily doings and dealings. While you are sitting comfortably on a chair or on a pillow on the floor, Antoinette will guide you and other meditation participants gently with her calming voice, using healing visualizations, gentle movements while sitting, and affirmations, to help you experience calmness and wellness. Participationg in a self-care retreat with others helps you to shift from your fears and suffering to experiencing your truth of "I am an infinite and magnificent being of love!" It also gives you a powerful space and time to generate and activate energy medicine for areas in the body that need healing and restoring. A one day retreat helps you embody a healthy practice and to anchor and integrate an enhancing longevity habit into your daily schedule. 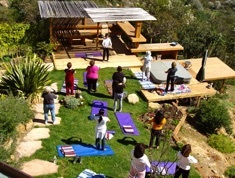 A retreat with Antoinette consisted of gentle and deeply healig Qigong movement, laying down- realxation time and walking meditation.